Around 100 people rallied outside of the Department of Home Affairs office in Sydney this afternoon against the Department’s decision to deport Kinley Wangchuck and their family. The rally demanded David Coleman, the Minister for Immigration, to use his discretionary powers and let the Kinley family stay in Australia. 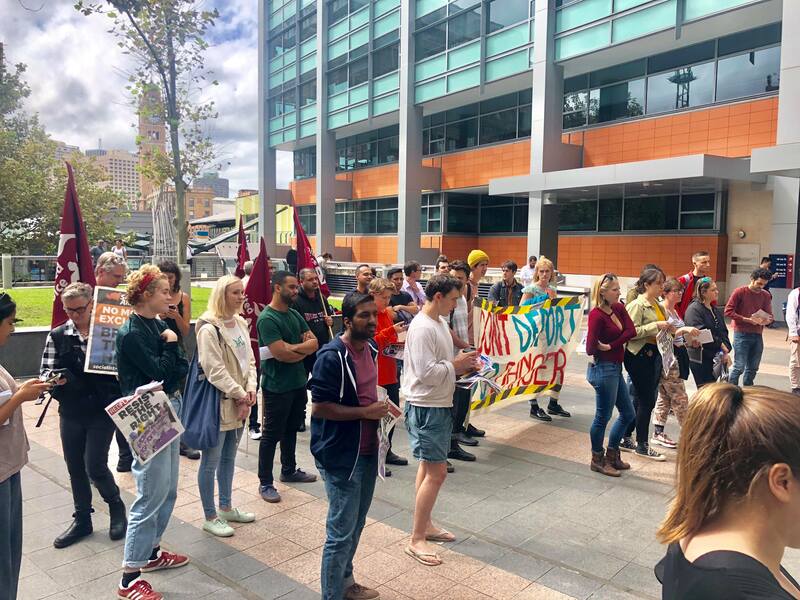 The rally was organized by the National Union of Students (NUS) Disabilities Department, who also organised similar ‘Don’t deport Kinley’ rallies in Canberra last week and Melbourne today. Kinley Wangchuck is a school student who has a hearing disability and is from Queanbeyan, NSW. Wangchuck and his family have been living in Australia for seven years. They are to be deported within a few days because Kinley does not meet ‘health requirements’ for permanent residency. According to the Department of Home Affairs, applicants need to meet this stringent health requirements to obtain a permanent visa. The Department of Home Affairs lists five most common health conditions identified for rejecting permanent visa applications, including intellectual impairment, HIV infection, functional impairment, renal disease or failure, and cancer. These vague conditions do not explicitly refer to hearing impairments and prove to do a disservice to those disabled in accessing equal rights and treatment. Kadol also spoke of a similar case in 2016, where Monash University lecturer Dr Biswaji Banik and his family were threatened with deportation solely because of his son’s disability. “Activism and community pressure reverse the decision of the department. hundreds of students and supports rallied across Melbourne and campus elsewhere and many more signed petition to let Dr benit stay,” Kadkol said. Another speaker also included Cooper Forsyth, the Organiser of Campus Refugee Action Collective and one of the organisers of United Voice.